The Optima® has the best of everything, with room for up to seven adults and a variety of seat heights formed to fit diverse body types comfortably. 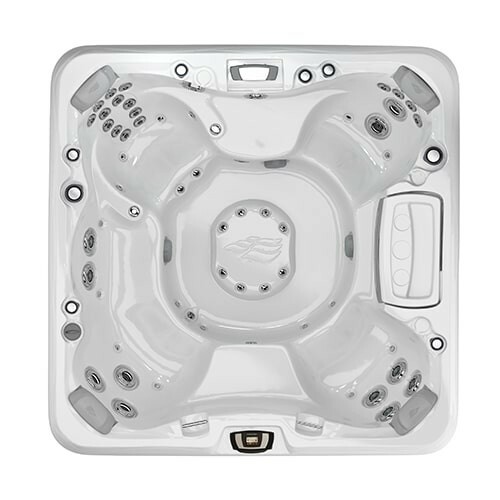 And with unique Fluidix® jet configurations and more massage therapy jets for the neck and shoulders than any other model, the Optima® is our most popular non-lounge Sundance® Spas model. Experience Fluidix® jets, from soft, skin-soothing bubbles that deliver aromatherapy to deep tissue release. 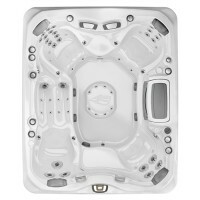 While the customer-favorite Accu-Ssage™ Seat is included in this spa, two unique jet configurations, with hip massage, make these seats exclusive to the Optima® model. A jetted foot dome also targets fatigued feet from any seat. 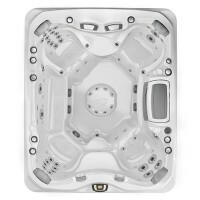 This seat features our deepest, full-body immersion experience, with arm rests and wrist jets. Accu-pressure jets on each side of this seat make it unique to the Optima® model. From should stress to overworked muscles in your neck and back, this seat, combined with soft tissue hip jets, is ready to help with a configuration only found in this model. Balance tension relief in your neck with rifling and oscillating deep tissue relief for your back, and soft, soothing jets at your hips for total back relief.